File Name: Ronald "Skip" A. Stone of Kinsley, Kansas. 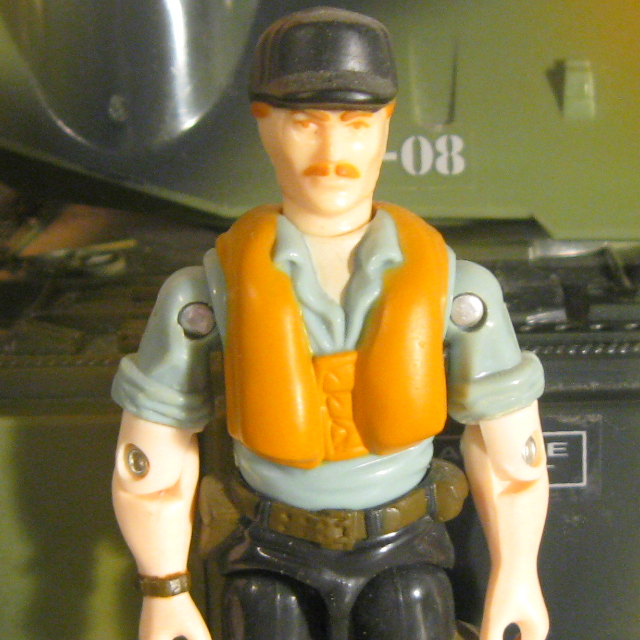 Sunbow's Cutter wore his 1984 outfit, with the life jacket often drawn as if it were an ordinary vest. In the DiC series, he wore his 1992 outfit. Cutter badgered his congressmen for two years to get into Annapolis. Then realizes his family lacked two essential ingredients: power and influence. Opted for the Coast Guard Academy instead. Wanted a life at sea even though hometown is as far away from either ocean as you can get (exactly 1,561 miles from San Francisco and NYC). His iron will and contrary nature, laced with a truly bizarre sense of humor, might explain why. Found out the Joe team didn't have any Coast Guardsmen. Raised such a stink that the Coast Guard top brass had to pull every string necessary to fix it. It also gave the brass a way to get Cutter out of their hair. Variations: Eyebrows and mustache either match the hair or are darker. Accessories: white "BM-201 short-stock boarding rifle" with curved magazine (new), clear orange light-up spring grappling hook launcher (new), white tripod (92 Duke's), white "Perfect Strike" spring grappling hook missile on black string (new), white long-neck flashlight, fits onto leg (new), black figure stand (common). Intercepting drug-runners in coastal waters and on the high seas is a specialty of the U.S. Coast Guard and that's where CUTTER learned his craft. He was the skipper of a high-speed drug interceptor craft before he transferred to the G.I. Joe team and now, on special assignment to the D.E.F., he can utilize those hard-earned skills to the max! 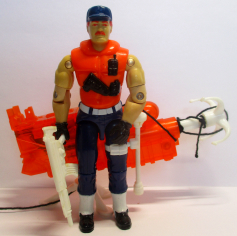 Armed with a rocket propelled grappling hook launcher, Cutter can snag speedboats crammed with illegal drugs, or scale the back walls of suspected hideouts and still have one hand free to shoot-it-out with the bad guys! Motto: "Nothing makes my day like taking down a big dealer. Seeing the look on his face when he realizes the high times are over and it's off to the Federal Pen for the rest of his miserable life! What a satisfying feeling!" Toy Notes: Item #6747. In the 1992 insert catalog, concept art appears instead of the actual figure. Accessories: black submachine gun (92 Barricade's). Repelling aquatic assaults and intercepting smugglers and spies on the high seas is a specialty of the U.S. Coast Guard, and that's where CUTTER learned his craft. He was the skipper of a high-speed Coast Guard ship and in charge of special Coast Guard operations before transferring to the G.I. Joe team. Now, armed with the firepower and technology of his newly acquired attack craft, Cutter can use his hard-earned Coast Guard skills to the max! To serve with Cutter on the Shark 9000 is considered a welcomed challenge to other G.I. Joes, a challenge they meet head on! Motto: "Busting Cobra villains in the SHARK 9000 is like shooting fish in a barrel!" Toy Notes: Item #6867. Originally intended as part of 1993's D.E.F. line, but moved into Battle Corps when the D.E.F. concept was canceled. Reissues: Included at the August 1994 G.I. Joe Convention with the C.U.D.A., a recolor of the A.P.C..
Cutter knows the high seas better than any fish in the ocean. But when a snake like Cobra decides to get its feet wet, best to be prepared for a big splash! That's where Cutter comes in. Like a great white shark with a ravenous appetite, Cutter is always ready to take a bite out of Cobra whenever they wreak havoc in the world via the sea. He may have been a typical land-lubber as a kid in Kansas, but after a family trip to Florida at age 14, Cutter was hooked on the sea like a sailfish on a 100-pound test line. His experience as a Coast Guard skipper in hunting down drug smugglers on the high seas made him a perfect catch for the G.I. Joe team's Aquatic Defense Division. Cutter likes nothing better than sneaking up on unsuspecting crafts and pounding them like a tidal wave. Now, instead of scouring the oceans for drug-dealing slime-balls, he patrols the sea for something else that's even more slimy...Cobra! Toy Notes: Item #53045. Very similar to the 1984 version, but slightly darker/duller and with no B on his cap. Accessories: black pistol (03 Beachhead's), orange life jacket with grey belt (07 Shipwreck's), dark silver boarding hook and handle on black string (08 Shipwreck's), black Joe figure stand. G.I. JOE CUTTER badgered his congressional representative for two years to get an appointment to Annapolis then decided to opt for the Coast Guard Academy instead. He wanted a life at sea even though his hometown is as far away from either ocean as you can get (exactly 1,561 miles from San Francisco and New York City). His iron will and contrary nature, laced with a truly bizarre sense of humor, might explain why. When he found out the G.I. JOE team didn't have anyone from the U.S. Coast Guard, he raised such a stink that the top brass in the Coast Guard pulled every string necessary to fix it. It also gave them a way to get him out of their hair. "Semper paratus. And I mean it - I'm always ready to take on COBRA on the high seas. Sure the're as nasty as a nor'easter in the dead of winter, but then again, I'm even nastier." Toy Notes: Boxed in a Toys 'R Us-exclusive three-pack with Deep Six and Lt. Torpedo. Item #36145, set 2 of 3. Semper paratus (Latin for "always ready") is the motto of the US Coast Guard.